This tutorial will teach you how to make this very nice card with a heart window on it. This is the perfect gift for mother's day, Valentine's day or for a birthday card! First of all, fold your white card stock sheet of paper in half. Draw a line using the ruler, to make a square. Cut along the line to obtain a square card. Cut up pieces of colored paper making sure they are smaller than the card. Stick these pieces on the front of the card. Print the template of the heart, and at the back of this template where the hearth is, put a piece of red felt paper. Make sure it won't move by sticking it with adhesive tape. Cut the hearth and the felt paper all together following the line of the heart. 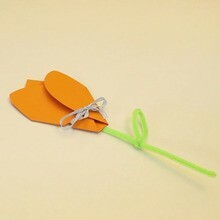 Stick the heart of felt paper you got onto the front of the card. For the next step, you can ask an adult to help you. We need to open the card and cut around the heart with the box cutter. Careful not to cut all the heart, one or two centimeters on the left of it must be left to make a window. Don't cut up the table too, put something under the card. Now you can open this soft window in your card. Draw some hearts or whatever you like behind this window. You can still write an entire poem in the card. This tutorial mostly teaches you how to make small windows in your cards. 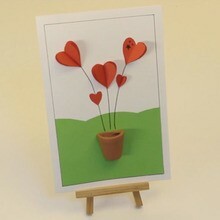 You can be creative and make the card as you like!